Established house with two acres of garden, heated swimming pool, refitted kitchen and bathrooms, underfloor heating. Set in the unspoilt terraces of Monchique Mountain, Casa Ginjeira is a very comfortable home with bedrooms all opening onto spacious veranda with southerly views across the foothills to the coast. In summer the high-ceilinged rooms are cool and there are plenty of shady spots to relax, as well as a large private pool which also enjoys spectacular views. An extended season is ensured with underfloor heating throughout the house and a swimming pool heater powered by solar electricity. The house is set in a large terraced garden surrounded by olive and citrus groves and ancient farmed terraces against a backdrop of cork oak forests. Water runs through the garden in a rill, with fountains and a large fish pond. The house has been completely renovated with beautiful terracotta floors which are heated when required and cool in the summer. The sitting room is furnished for comfortable evenings around the fire. All the bedrooms enjoy the spectacular sea view and have french-windows leading onto the veranda. There are two spacious bathrooms with baths and walk-in showers. Outside there is a further bathroom with shower, convenient for the pool. The well-equipped kitchen, decorated with traditional Portuguese tiles, opens onto the dining room, with a large dining table. There are several other places to eat outside - by the pool, where we have a built in barbecue, or in the shade of the veranda. Above the pool is a decked area surrounded by flowerbeds providing another place to relax on sun-loungers under grapevines clambering over a rustic pergola. A five minute walk up the track takes you to our favourite restaurant serving the best piri-piri chicken in the area, and there are other great restaurants serving local specialities. The pretty market town of Monchique is just 4km away, with more restaurants and bars and a large supermarket where you can buy anything you may need. Further afield you have the choice of two coastlines within easy reach; the glamorous and busy South, with its golf courses and nightlife or the wild and spectacular West, with world class surfing. Wherever you go it is a pleasure to return to our peaceful valley. The air is filled with the scent of eucalyptus and orange blossom and nothing but the sounds of gurgling streams, birdsong, chirping crickets and perhaps a lone frog. Nightingales are numerous in the spring, and other birds such as the Hoopoe, Azure-winged Magpie and Golden Orioles may also be spotted. I have been coming to Casa Ginjeira since I was a child. My parents decided to build a large pool above and behind the house so that their long naps were not disturbed by the sounds of my sister bullying me. My parents planted many trees including jacarandas and orange trees, which are all now fully grown. My parents first came to Portugal in 1968 and fell in love with the Monchique area. In 1970, whilst on a walk in the valley my father found a half-built house nestled on a magical site among cultivated terraces with stunning views to the coast. They bought the property and finished the building, employing 40 workmen including José with a winning smile, who stayed on as a gardener and still grows potatoes on our land for his own use. As a child I played with José's son Carlos, who is now the builder responsible for carrying out the great improvements of the last two years, and his daughter Euália is our manager. Casa Ginjeira is ideal for a completely relaxing holiday of gentle strolls around the mountain, lazing by the pool and walking up to the local restaurant, but it is also ideally placed for venturing out, with easy access to the South and West coast. As well as taking trips to the sea, there are miles of empty lanes that wind around the valley to be explored on foot or on the bicycles that are for use of guests. There is underfloor heating throughout the house enabling a comfortable stay off-season. The wonderfully dark evenings (no light pollution here) can be spent out on the verandah watching the twinkling lights of Portimao on the coast or trying to spot shooting stars in the vast blanket of stars above. All the bathrooms have been upgraded to accommodate underfloor heating. The large en-suite bathroom to the master bedroom has twin basins, a bath, walk-in shower and seperate wc. It can also be shared with other rooms since it is accessed via a lobby. 2nd bathroom with bath, walk-in shower and wc. Separate lavatory off hall. The villa is heated by underfloor heating via a very eco-friendly air exchange heat pump. Every room has an adjustable thermostat and the cost of heating is included in the rental. There is wifi throughout the house. The smart-tv allows internet access too. We provide towels for our guests as well as a supply of towels for use at the beach and swimming pool. Sitting room with log burning stove. Wifi broadband, Telephone and Smart TV with dvd and cd player. Bookcase with many books and cupboard with games, dvds and cds. Refectory dining table with benches seats up to ten. It was designed by my father. We are subscribed to a Portuguese cable network that has international channels, including news and films in many languages. There are two bluetooth speakers and a cd player. We have been collecting holiday reading for forty years and there is plenty to choose from for all tastes from bonkbusters to nobel prizewinners. Backgammon Cards Many other fun games such as Articulate, Pictionary, etc etc. A collection of classical and popular cds. We have a large collection of DVDs for your use. These bicycles are only suitable for short trips as they are fairly old and heavy. All the rooms open onto a wide veranda which is partially shaded. The terrace beside the pool has a large built in barbecue. Morgado Golf Course is less than 30 mins away on the road to Portimao. It is a very popular golf course with extremely reasonable fees. Surfing is popular on the west coast at Arifanna. There are hire companies that will provide you with all the necessary equipment. The house is on one floor only, however the pool is on the terrace above and can only be reached by the stairs (there is a hand rail). The internal doors are not wide enough to allow wheelchair access, but the french windows onto the veranda are 130cm wide, and we have have used this method to get around the problem. A bath handrail is provided. Our large pool is heated when needed by a solar powered heat pump from April to October at no extra charge. This provides comfortable swimming temperature. Notes on accommodation: Casa Ginjeira is a comfortable house attractively furnished by the artist owners who have cherished it for 45 years. The granite walls keep it cool in the hottest weather. During the winter of 2014-15 we have installed underfloor heating throughout the house, which will extend the season. It is powered by an eco-friendly heat pump. In the sitting room there is a large selection of books on the shelves and a cupboard full of games, dvds and cds as well as a guitar for any musicians who have been inspired by the nightingales. Outside: All the rooms open out onto a deep South facing veranda with views to the sea. There are steamer chairs for relaxing and a table for al fresco dining. To one side is an olive grove, and below is a secluded garden with flowers and jacaranda trees where you can laze in a hammock. A winding path leads further down to the orange grove, where you are welcome to pick oranges, lemons and tangerines for your breakfast. The large pool (10m x 5m) is fed by mountain spring water and is up some steps behind the house with a fantastic view to the sea. There are plenty of sun loungers and a tiled table and benches for eating under the olive trees. There is a cottage on the same level with a ping pong table and various beach games/boogie boards et. Utility Room: Laundry room with washing machine, sink, airing cupboard, ironing board, iron. Cleaning / Towels / Linen / Maid service: Linen and towels provided. Towels for the house only, not to be taken to the sea. Linen changed once a week. Beach and pool towels also provided. Other: Dining room with large table seating 10, and doors leading onto the verandah and out to the sunny courtyard. Poolside cottage with ping pong table. We booked this for a group of 6 and everyone enjoyed their stay. With so much space it is a great place for large groups. It's not the newest of places but it is comfortable, has all the amenities and a lot of character. The kitchen is large and has all the necessary equipment. Bedrooms are comfy and clean. The huge patio with views of the south coast is great for outdoor dining and lounging, and the large pool is great for cooling down. The gardens and surrounding areas could use some work but that's a minor gripe. We would happily go back there ourselves and certainly recommend it to others. We had a wonderful time, and generally were very lucky with the weather, the space, the various balconies and the pool were excellent. As a group we were all keen on wildlife, we identifies thirty nine different species from the villa, and well over one hundred species during our travels ( which were quite extensive), lots of butterflies and due to a wet spring the wild flowers, especially in the Alantejo . If your idea of of a great holiday is peace and quite, with good restaurants near by, two within walking distance, and a good supermarket also quite close, then this villa is for you. 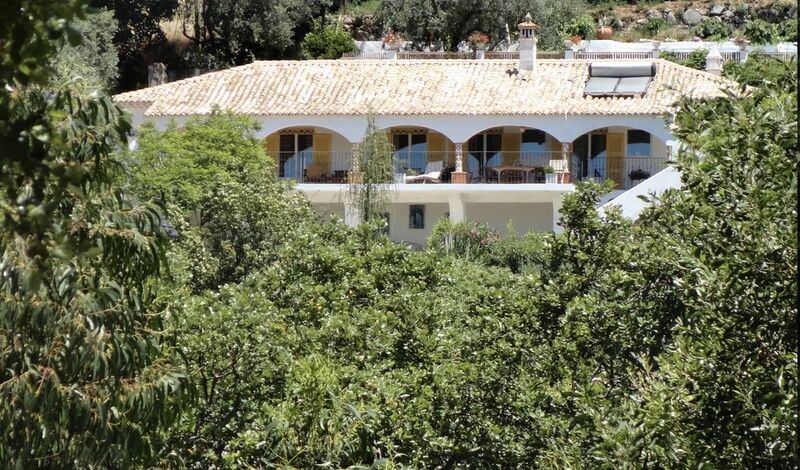 Ideally situated close to monchique yet totally secluded. Generously equipped. Underfloor heating much appreciated in cool winter evenings. Excellent pool. Friendly welcome. We were a group of five friends and were unanimous about Casa Ginjeira - an outstanding and unique villa, which is far removed from the usual sterile places you can rent. Lots of personal touches, with flowers from the garden in many rooms, made the house seem more like a much loved home. We made good use of the beautiful and generous terrace and an equal amount of time in the fantastic swimming pool. Lots to see in the local area, we would very much like to return. We are so delighted to hear that you had a good time and that you liked the house. We would be happy to welcome you back for another visit. We were at Casa Ginjeira in the end of October. Our whole family (German family with three little children and grandparents) enjoyed very much the beautiful house with it's giant garden, awesome view and the nice pool. The children loved to run around outside and pick up some chestnuts. We made some very nice excursions to the beautiful towns and villages of the region and the impressive coast. Most days the weather was very nice and when it rained one day we made a chimney fire and enjoyed the cozy house. One time we were at the restaurant Jardim das Oliveiras near the villa, which was very good. The South coast is about half an hour away (27km). Forty minutes of driving on empty roads through beautiful mountain scenery takes you to the unspoilt West coast beaches with their natural habitats and great surfing. Beautiful beaches west of Lagos can be reached in under an hour. 1 hour and 15 minutes to the airport. Car hire is essential. The attractive town of Monchique is 4km down the hill. Golf is very popular in Algarve, our nearest course is Morgado, 21 km south. Surfers head for Arifana Beach on the West Coast. A beautiful drive of 40 minutes. Jose, who has worked for us since 1970, looks after the pool 3 mornings a week. He farms the terraces near the house and you can buy organic vegetables from him. His grand daughter Eulalia is the house manager. She is fluent in English and will deal with any problems or questions you may have. Booking Notes: A non-returnable deposit of 30% on making the reservation. The balance to be payable 6 weeks before arrival. Heating the pool can be very costly out of season because the nights get cold up the mountain. In the high summer it is not necessary anyway. Changeover Day: Flexible. Notes on prices: Prices are for the property per week in UK Pounds. We would like to offer a discount for two persons when possible (i.e. not in high season). A charge is made for extra days pro rata. Cost of underfloor central heating, electricity, gas for cooking and logs is included in rental, but cost for pool heating is charged extra according to oil used shown on the gauge. The pool takes up to a week to heat, so you will be charged for this if there has not been anyone else before you.